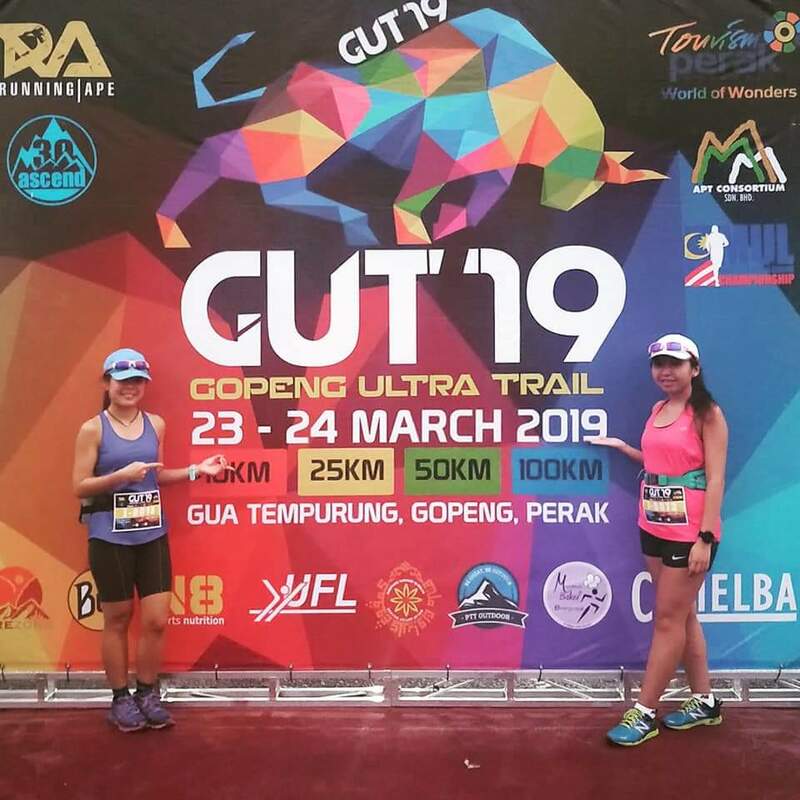 My Gopeng Ultra Trail 2019 [25km] (by Lingderella) | JustRunLah! Gopeng is somewhere near to Ipoh and Kampar. It’s about 6 hours(or more depending on speed of vehicle) car ride from Singapore. We didn’t follow any group to go from Singapore and went on our own. It’s my second trail race. 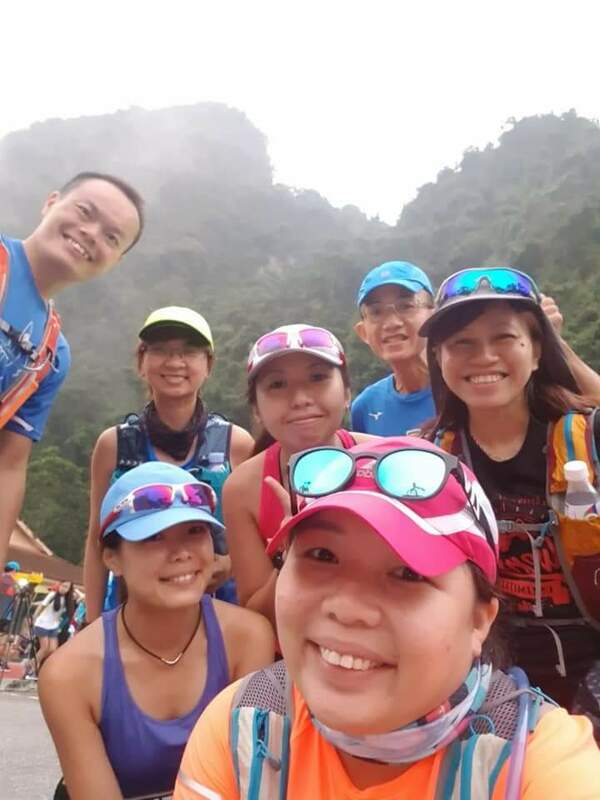 My first trail race was the Vietnam Mountain Marathon, which I participated in the 21km category in 2017 but these are totally different experience. We arrived a day earlier before the race day to collect race pack at the race village near the start point at Gua Tempurung. There isn’t any queue and we collected our bib and race tee very fast. We had to sign a disclaimer form on the spot as well, to sign it simply means if any injury or etc the organizer are not going to be responsible. I always buy travel insurance when I go for overseas, better to be safe than sorry. There was three or four stalls selling those mandatory items for the longer distance runners such as emergency blanket, whistle, foldable cups and bowls, compass, gels and etc etc the prices of these items were very reasonable. 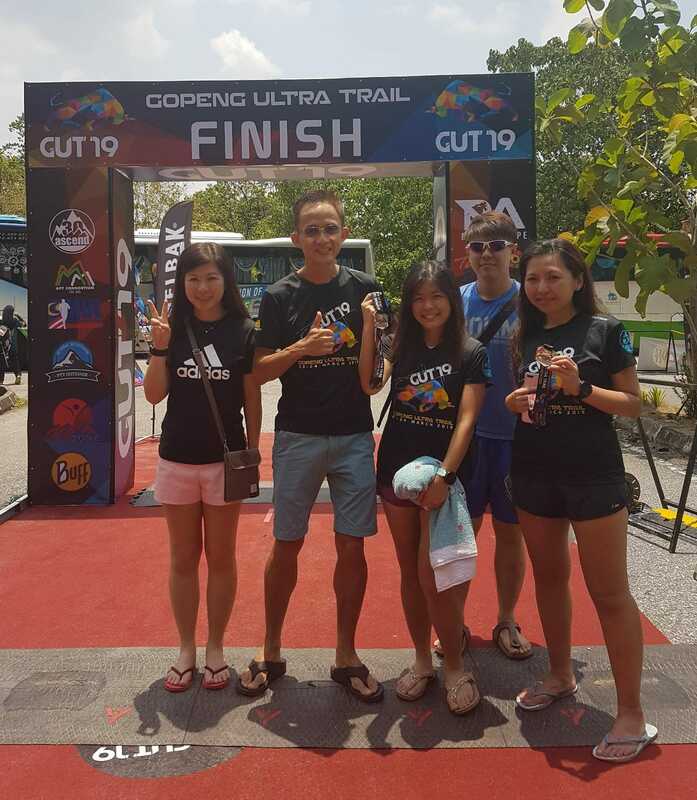 Christine, Winson and I participated in the 25km category, while Karen participated in the 10km category which flagged off on Sunday morning. 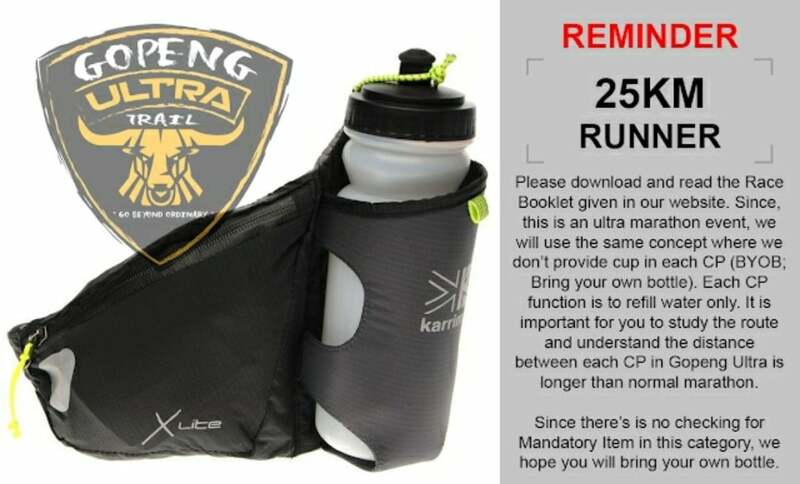 It was not mandatory for the 25km and 10km participants to carry any of these mandatory items. But the 50km and 100km runners had compulsory mandatory items checking and also to check in their drop bag for the checkpoint at the race village. I remembered visiting the Gua Tempurung in 2014 with my family on a road trip visiting Cameron Highlands, Ipoh and Penang as well 😊 I love road trips! Malaysia have many beautiful mountains, lakes and waterfalls etc these are all beautiful natural environment, if they were well maintained or taken care of properly, these will be very very very much more beautiful places to visit. 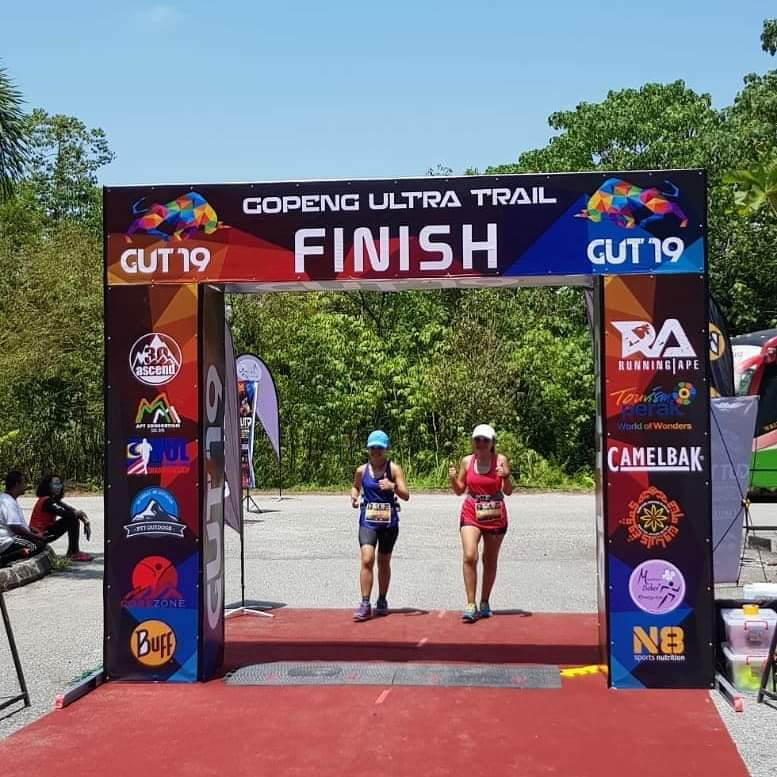 This was only the 3rd edition of Gopeng Ultra Trail(GUT), theres still many rooms for improvements. There were 4 different distance categories, 10km, 25km, 50km and 100km individual or duo. I can’t imagine myself chasing for the title of “Ultra Marathoner” or even “Ultra Trail Marathoner”. 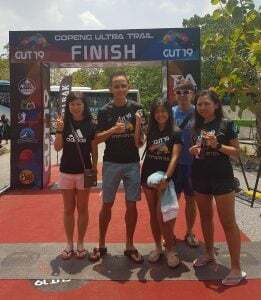 These titles are too godly and to be exact, I don’t have the courage to attempt these titles yet 😆 The word “trail” in my dictionary was something like Macritchie Reservoir. And I’m a noob in trail and too naive already 😂 First of all, I’m too lazy to train in slopes/hills after Tokyo Marathon. I was exhausted and I just want to rest and didn’t run much after Tokyo Marathon. 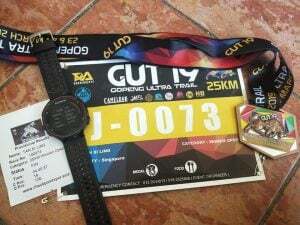 I prayed that my 42km done for Tokyo Marathon was enough to last me the 25km for GUT. I know there would be some elevation, but I underestimated on how tough it would be. Prior to the race, I heard Winson said something something about downloading the map into our watch but I wondered what was that? It’s the first time I heard about downloading map into watch. Do I really have a need to download the map as I’m doing 25km, it’s not like I’m doing ultra distance. I don’t think my watch have that function anyway. Flag off for 25km category was at 7.30am on Saturday. On race day, we arrived a little more than an hour earlier to the race site. 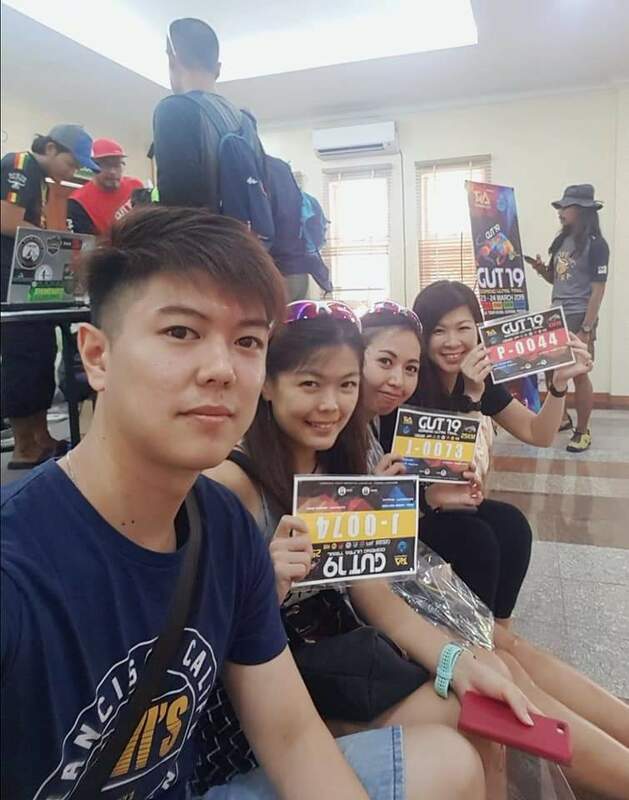 It was a long line of cars parked on the both sides of the road outside the entrance to Gua Tempurung as the entrance was blocked by the race organizers and cars couldn’t park inside. Those 50km and 100km runners who came later I think might even had to walk at least 1km or more from their car to the start line. We were only just in time to hear the gun off for the 50km runners. The 100km runners were flagged off even earlier at 4.30am, their cut off time is 28 hours 😵 Can’t imagine myself keep going for that long. Christine and I were rather concerned when we were reached the race site. We looked like we were very under dressed compared to many other runners. 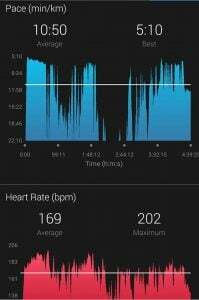 Both of us were in shorts and singlet and we only had 500ml bottle hydration belt. We thought maybe we are not under dressed and others were over dressed. Or actually what I think was it’s not about being under dressed or over dressed, it sort of depends on fitness and tolerance level of individuals as well. I wished I had wore compressions for the race, carried a hydration vest with at least 1 litre of capacity and brought along a trekking pole. It was then I realised what we wear or the gears and equipments we brought along can be very important for safety in trail running. Maybe I wouldn’t have suffered the slight rashes if I was in compression tights, I also suffered a bruise for happily sliding down the slopes on my buttocks. 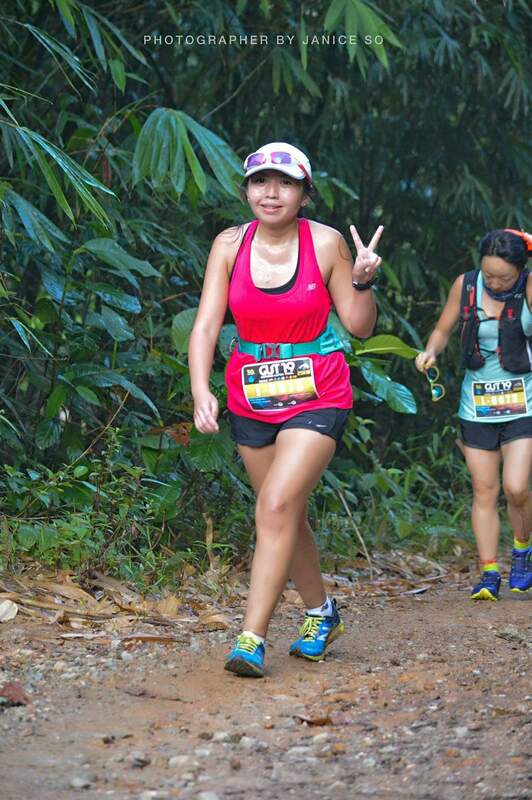 Funny part was that I was even in racing shoes, which I regretted much in the later part of the race 😂 I have only one pair of trail shoes bought a few years ago and had not wore those for quite long already and I worried that it might crack or give way during the race if I wore them. 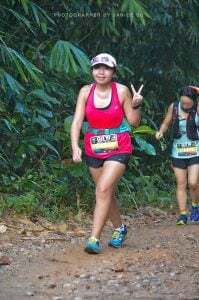 I thought that I’m fine with running in racing shoes in Macritchie Reservoir so I thought I would be fine in GUT as well 😂 Other 25km runners were in full compression wear, hydration vest that looked like they are able to carry at least 2 litres of water, they had trekking poles as well. I couldn’t remember much of the run and didn’t take any pictures during the entire run because I was busying cursing and swearing a lot(at least it wasn’t out loud but silently in my heart), wishing it would be over soon, too busy being a scaredy cat and being a super negative and irritating women 😂 It’s just weird, I kept wondering why does time passes so slow but next moment realised I had finished the race and then wished for more. Still pretty early into the run, there’s a small long stream to cross, it’s more than a metre wide, those with long legs or good at long jump would have no problem. But being a person who’d almost never pass any Napfa test during my schooling days I stand on the same spot for a while still clueless but I observed how others crossed 😂 Most runners didn’t care and got wet knee down. 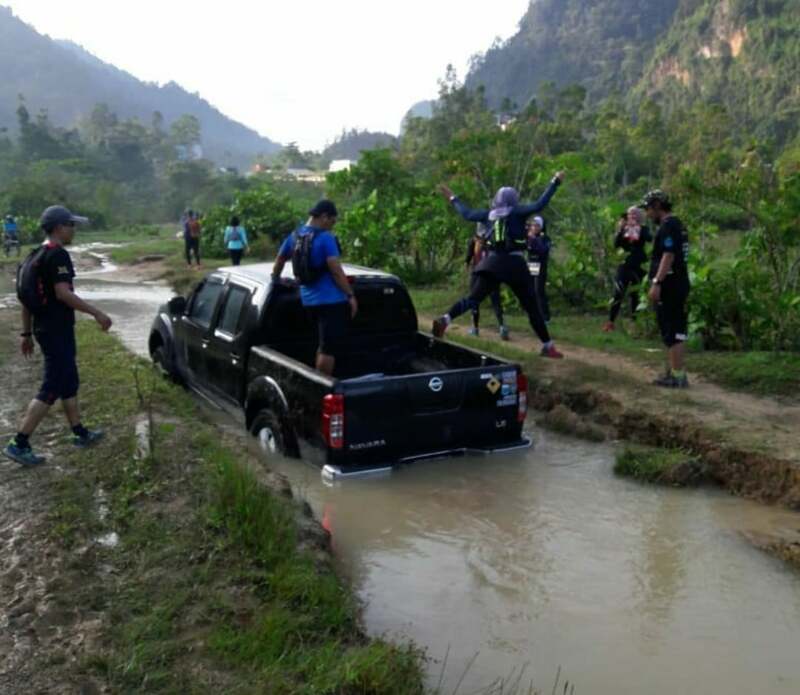 I thought it’s either getting wet so early in the run, or used the truck that was stucked in the water as a stepping stone. I didn’t see any owner of the vehicle around but the engine was still running. I saw a runner climbed on it to cross over and I followed. Shortly, I arrived at the first checkpoint. There’s timing mat and a volunteer taking down our bib number. There’s no cold hydration but I filled my bottle full and ate a slice of orange and carry on. Just a turn and comes the first slope at about 9km. It’s runable to those trail elites, but most of us walked up. It’s steep but still walkable and runable, it was also then I wished I had a trekking pole with me. It would have save me a lot of effort. It was a long climb and took me at least 30 minutes or so. It was tough and tiring! After a long climb up I froze, another runner beside me also froze because a runner in the front u-turned, he claims that it’s the wrong route then just sped off back. Another runner came from behind us carry on running forward and said in an assuring manner that the direction we are heading towards to was the correct way. Most runners and I followed and didn’t u-turn. It’s about 10km or so into the run already and there’s hardly any marshals along the way and there was no distance marker at all so far and it’s just the red and white stripe tape tied on branches and some of it looks super old that the colour faded and seems like it was there for years already and doesn’t look very trustworthy at all. Just another 200m or lesser, I saw the signboard “25km” with an arrow pointing left. I was so relieved, at least I’m assured I’m at the correct path. I got a shocked when I got near. The path on the left was a super narrow path and both sides were ravines. Somemore it’s also going downslope. It was quite dangerous, could slip and fall. Anything could happen and it could be any possibilities and outcome. 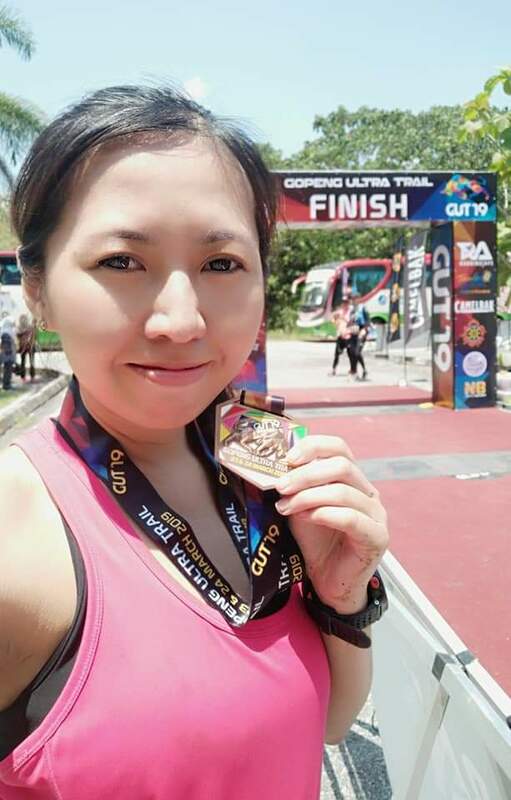 It’s not worth to sustain any injury during a runcation which I considered gotta be a happy holiday, I was slow and careful every step I took and not exaggerating, at that moment it started to feel like I’ve registered for a race which the objective is to complete the race safely and not a simple 25km trail running. A while later, Winson called me from behind. He was one of the runners who ran the wrong route and ran an additional 4km. Luckily he was informed to turned back and he even won the 4th Veteran Men placing with the additional distance 💪 A while later, I reached the 2nd checkpoint for the 25km runners. It was a checkpoint that the 50km and 100km runners would come to as well. Drank finished my water and drank some Coke and refill my bottle full with water and carried on. I think I saw some food and soup available at this checkpoint but I think it’s only for the longer distance participants. Shortly after the checkpoint, I reached my 2nd climb. It’s damn awfully tough. It’s my toughest and steepest climb, my toughest race. I’m climbing slow yet my heart was thumping so fast and loudly that I could hear it, I’m already drenched in sweat and my sweat was still dripping like faucet. I took many breaks in this climb. It’s a narrow path for one person to climb at a time. Almost after every few steps I took, I had to stand a side to let other runners overtake and use the time to catch my breath. I was so tired and both of my legs went jelly. Many people overtook me and it was pretty demoralising. Christine who also ran about 4km extra as she ran the wrong route had also caught up and overtook me as well in this climb. The climb was so steep and both my legs was so jelly that I was climbing using all my limbs, I also used my hands to grab the branches and roots of tress to pull myself up as support. I was exhausted. The exact word to describe how I felt at that climb was desperation. My hands sunk into the soil at times to pull myself up and my foot kept sliding as well. I was grateful for a kakak behind me, she pushes me up for a while and I thanked her. It was hot and temperature even gotten up till about 36 to 39 degrees according to some runners 😵 But I was glad that there were plenty of shades from the trees around until the last few km, luckily I got cap and sunglass with me. I got super worried as my water was running out. I knew I should rationed my water wisely but I was too thirsty. I just left the last checkpoint and my bottle was empty. I told myself I need to be thick skin and ask for water as I started to feel drifty and floating. I asked two runners and both were super kind to offer me some water. 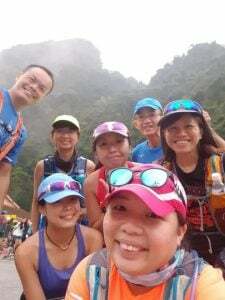 Finally, I was at the peak, it was a view of plantations and the surrounding but I got simply no mood to take my phone out to take photos like the rest of the runners. I didn’t care or stop and admire what others may consider as a beautiful view and I kept going because the Sun was burning and there isn’t trees around to provide shades. Finally, it was going downslopes but I was too tired to run. There were also a couple of steep downslopes and I actually sat down and used my buttocks to slide down. Again, came a junction with no direction signs and what’s worst is that no red and white tape in sight. Paused a while and waited for a few other runners who were like me being lost there. I even took out my phone and opened Google Map. It came a route of 6km to Gua Tempurung and I was super relieved again as I was on the right track up till that moment at least. A men in GUT tee-shirt showed up on his motorcycle and we stopped him and asked for directions and he rode off to check and returned shortly and pointed us the direction. The group of about 7 to 8 of us then walked together. We were at tarmac road but I didn’t have the motivation to run. After some time when we reached a T-junction we were shocked! We saw 25km runners coming in from our right side. We were at the wrong route, it was then a female runner with us started scolding vulgarities which I can only understand a few words. Even that marshal/volunteer/commitee in GUT shirt gave us the wrong direction at that last junction we were in! 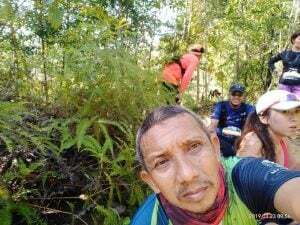 😤 After sharing some information, we got to know that there was a last checkpoint we had missed and all of us turned right and head to the checkpoint which was about 500m away according to one runner. After a while, I saw Christine again and she was extremely shocked to see me but I told her that she was going the right way. I was actually quite happy to see a familiar person and was motivated to start running again as I thought I could try and catch up with her. I ran towards the checkpoint to get my bib recorded, refilled my bottle and carried on running. It was only about the last km or so that I finally saw Christine again and we head to the finishing line together. The volunteer hung the medal on our neck and it was a gorgeous hard earn medal. I went to a tentage print out my result slip. I was the 19th runner to come back in the 25km women’s open category. I gulp down at least a litre of ice cold water but got no appetite for the food for the runners at the race village. We saw the top 50km runners finishing as well, Karen and I go explore one of the tents where the volunteers were issuing out the finisher tee and medal for the 50km runners, it was then we saw a 50km female runner was being denied of her finisher tee and medal because they did a check on her mandatory items and found that she don’t have 3 items on the mandatory items list and she was disqualified 😨 The volunteer told us that there is penalties if runners did not have the mandatory items. Such as if 1 and 2 items are not in possession from the mandatory list would result in additional finishing time and short of 3 items onwards would result in disqualification. Didn’t know that it would be so strict, but heard from other runners that it was a random check. This run was a completely different experience and is the toughest one of all of my past runs. 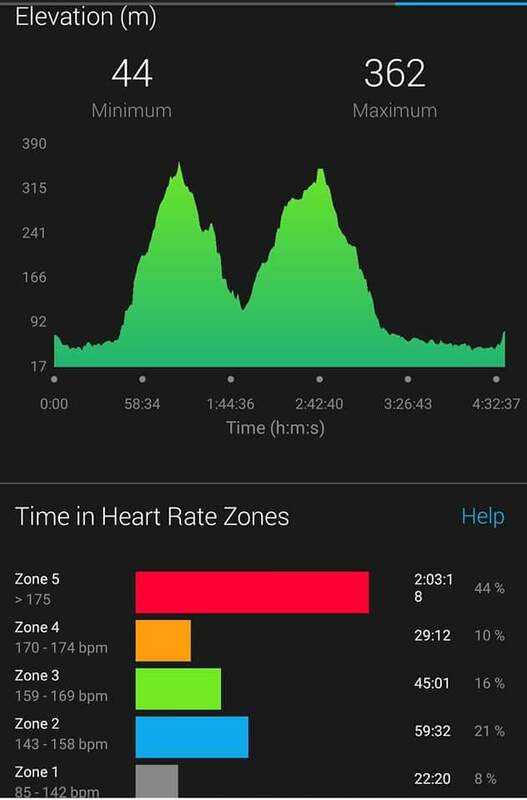 I’m new to trail running and this race was really an eye-opener for me. 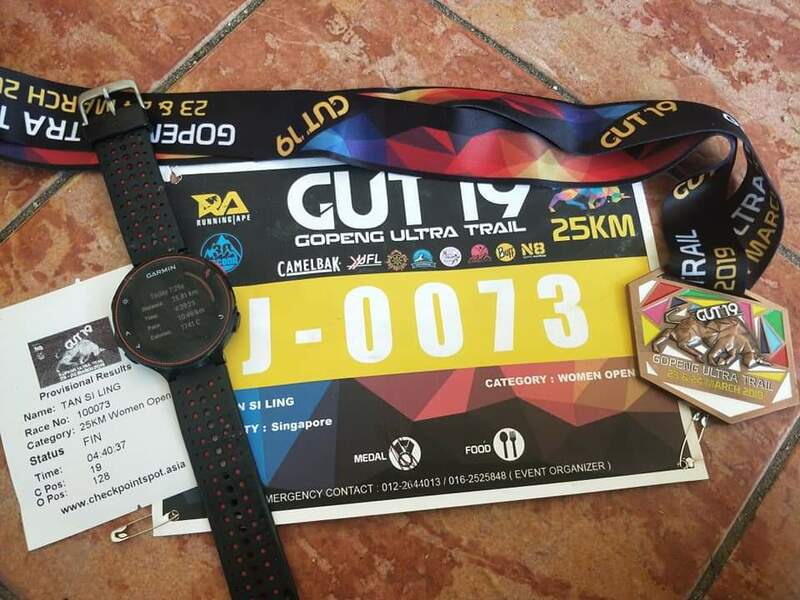 Though it was poorly organised run for the 25km runners, I still had a good run and it was a good experience for me. 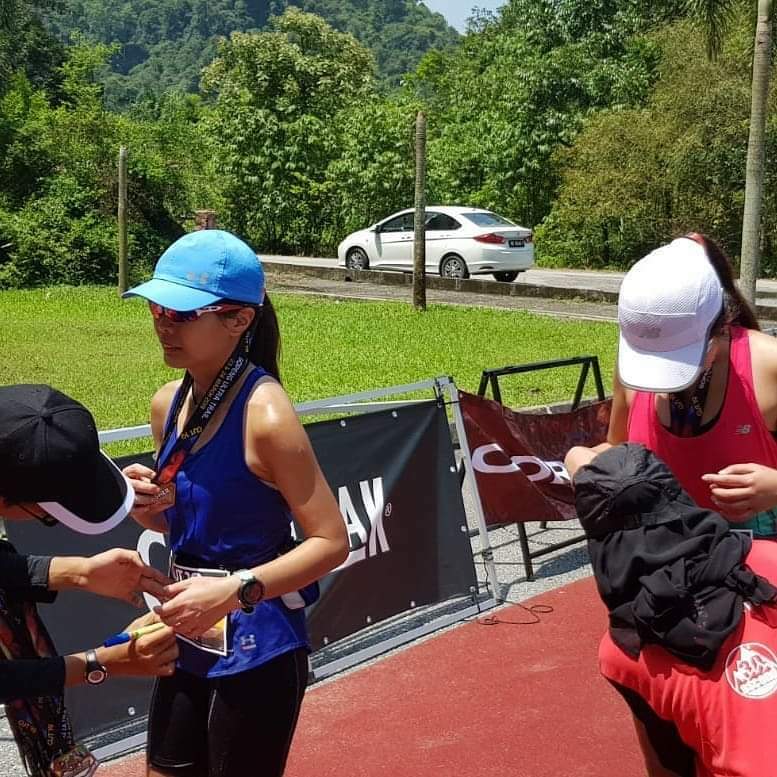 Most of the reviews from the runners in the official facebook page were quite positive from the 50km and 100km runners except the 25km runners. It was memorable and after all the tiredness gone, I actually enjoyed it and would like to participate in trail running again. Also, time to invest in a sports watch with the function of live map(or whatever it’s called) available if I want to continue running in trail, if not I have to learn how to study those paper map and study how to use a compass already!